Constance Kangueehi, a former student, teaches the next generation. (LWI) The Lutheran World Federation (LWF) is dedicated to the education of young people and giving them a perspective for the future. At present, the LWF is involved in educational projects in Kenya, Myanmar and Colombia – mostly for people on the margins of society. Education is also one of the UN’s 17 Sustainable Development Goals, which will be discussed at the Twelfth Assembly in Windhoek, Namibia. What such projects can achieve is shown by a look at the history of Namibia. The LWF’s commitment in this country is visibly expressed in the Martin Luther High School. Founded in 1962, it was one of the few secondary schools for black students. The LWF has been very concerned to keep it going. 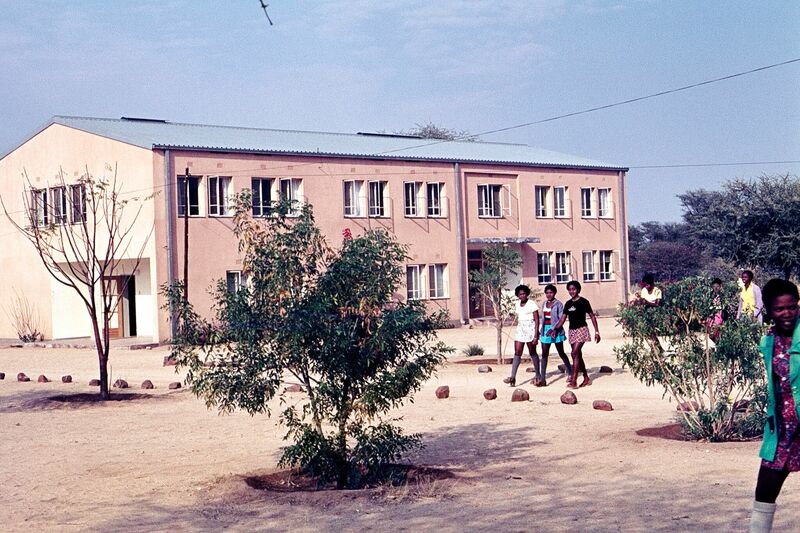 Still today, 27 years after Namibia’s independence, the school is church-run and makes an ongoing contribution to educating young people in Namibia. The former students of Martin Luther High School include some well-known figures. The most prominent is Dr. Zephania Kameeta, the present minister of poverty eradication and social welfare, and former bishop of the Evangelical Lutheran Church in the Republic of Namibia (ELCRN). 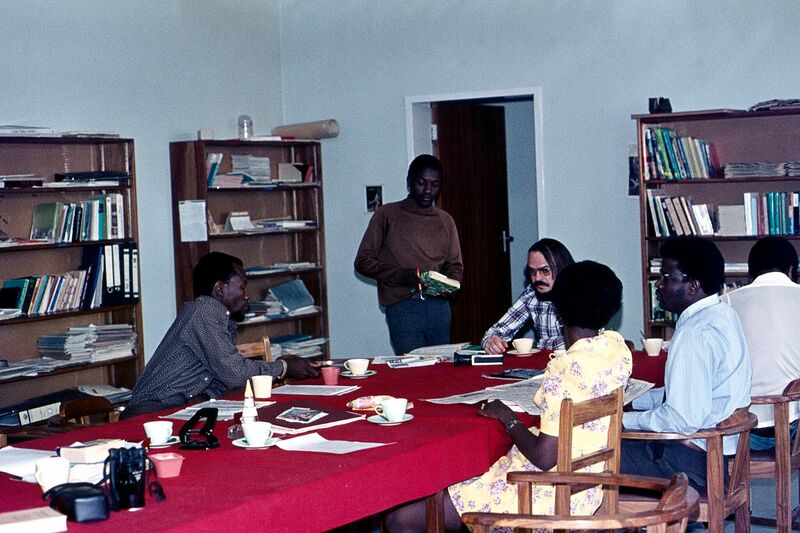 In the 1970s, Daniel Tjongarero, a convinced and active Christian, was deputy chairman of SWAPO (South West African People’s Organization) in Namibia. After independence he first became a deputy minister in the Namibian government and then director general of the Namibian Broadcasting Corporation. Jefta Tjozongoro was from 1976 to 1986 the first black headmaster at Martin Luther High School. LWI spoke with Gottfried Tötemeyer, who worked at the Martin Luther High School from 1963 to 1975, about its beginnings and historical developments. The son of a missionary, he was born in Namibia and, from 1968 to 1975, was himself the head teacher. The staff room with some of the teachers. 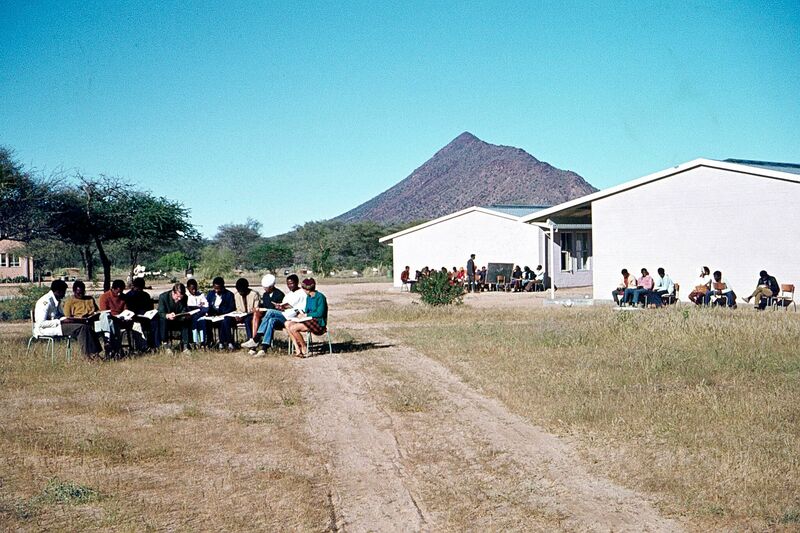 The young Evangelical Lutheran Church (Rhenish Mission Church) – ELC, which became independent in 1957, commissioned the German missionary Emil Kerstan from Karibib in western Namibia to establish a church high school. In modest and partly dilapidated rooms, the Martin Luther School opened its doors in 1962 for about 40 black students. At the beginning, the staff consisted of three teachers: headmaster Ortwin Jung from Germany, Josua Hoebeb, a black Namibian, and Gottfried Tötemeyer. After a few years it became clear that the school needed new premises. Because of the prevailing apartheid policy, obtaining a new location entailed difficult negotiations between the ELC leadership and the South African minister for Bantu Administration. 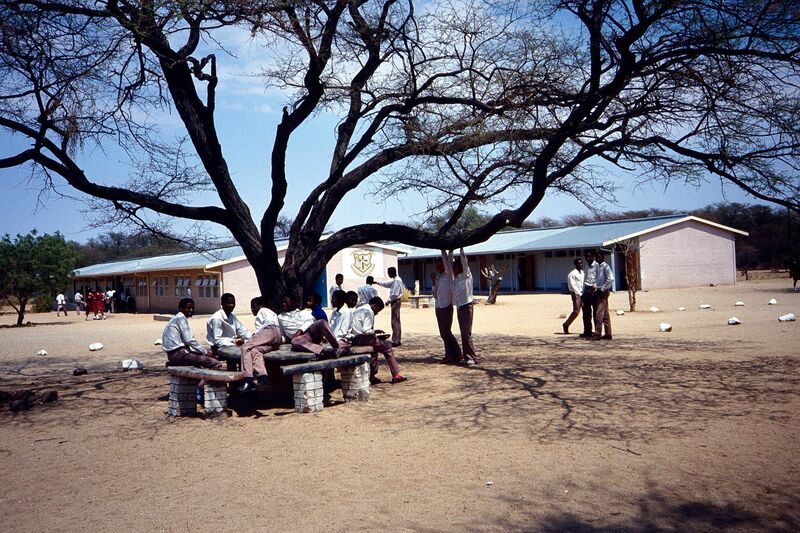 In 1970 the school moved to Okombahe, about 120 kilometers northwest of the old location in Karibib. The new site was a relatively remote farm, bordering on the Damara Homeland, an isolated residential area for the Damara people. A school was erected for 120 students, boarding facilities for boys and girls, a building with a kitchen, dining-room and laundry, a small power station and the houses of the teachers and technician. Being so remote, the whole complex had its own water and power supply. This project was financed mainly by German church partners, notably the Evangelical Church in the Rhineland and Bread for the World. The funds for maintenance also came from abroad, mainly from the LWF, as the local church could not raise the amount needed. The girls’ boarding house at Martin Luther High School. In the 1970s, in particular, efforts to change the political and social situation in Namibia came under two headings: the Black Consciousness movement and Black Theology, which were committed to freedom and equal rights for black Africans. In the context of oppression, these theologians appealed inter alia to Martin Luther‘s “On the Freedom of a Christian”. The black population was suffering under the burden of oppression, discrimination, violation of human rights, and occupation. It was calling for political freedom and national independence. By its very name, the Martin Luther High School placed itself in this tradition. 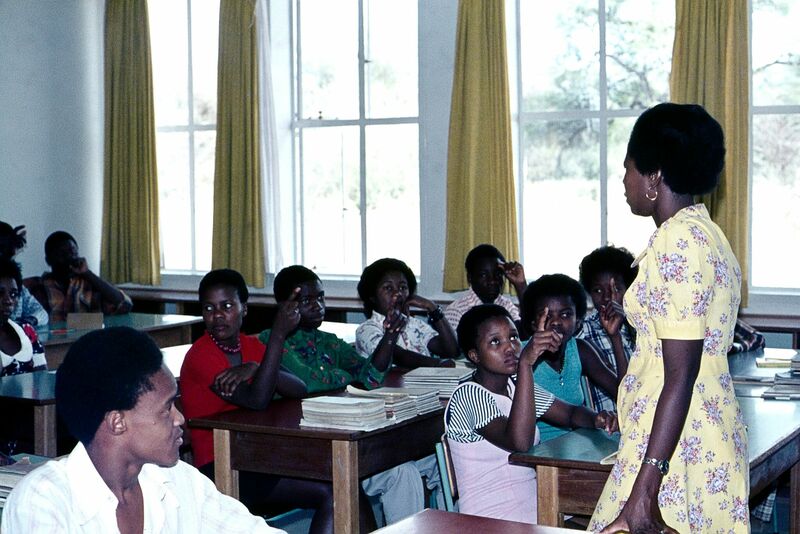 When the school moved to Okombahe in 1970 the number of teachers rose to 13. Headmaster Gottfried Tötemeyer pursued the policy of “making the white staff superfluous to demonstrate to the white rulers that blacks were quite able to take responsibility.” So when the contracts of teachers from Germany expired, their positions were gradually filled with qualified black Namibians. In winter, classes sometimes took place outside in the sunshine as the classrooms could be very cold. A further confident signal against apartheid was sent by Martin Luther High School in 1976, when it dropped the Bantu educational system, under which Afrikaans – a language associated with the South African oppressors – was the only medium of instruction. With the support of the church leadership, the English-language curricula from Botswana, Swaziland and Lesotho were introduced for grades 8 to 10, while grades 11 and 12 prepared for the internationally recognized Cambridge English exam. Students drafted scenarios of what the future could look like when the goal of freedom and independence for Namibia was reached. Teachers drove into the towns on the weekend to speak up for freedom and independence at meetings in the black townships. This commitment to freedom and independence did not escape the South African security police. Teachers from Martin Luther High School who held meetings in the townships were detained for a while, the school telephones were bugged or letters opened. Through overseas connections, the partner churches and organizations like the LWF were regularly informed about these repressive measures. “It is important to mention that the change in the status quo was supposed to take place peacefully,” Tötemeyer underlines. The road was long and rough. Finally, however, the first free elections took place in Namibia in 1989, implementing UN Resolution 435. On 21 March 1990, after a peaceful transition, the country achieved its independence from South Africa.